This standard sets forth design, fabrication, and performance recommendations and requirements for mobile radioactive waste processing (MRWP) systems (including components) for nuclear facilities. The purpose of this standard is to provide guidance to ensure that the MRWP systems are designed, fabricated, installed, and operated in a manner commensurate with the need to protect the health and safety of the public and plant personnel. 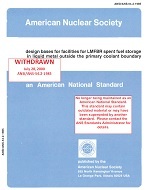 For the purpose of this standard, a nuclear facility MRWP system begins at the interface with a permanent plant system, or waste collection area, or both; it terminates at the interface where processed waste, or secondary waste, or both, is either returned to the facility or is removed from the facility, or both.